To make toothsome dinosaur-themed treats both great and small, Animal Face Cutters are hard to beat. And because you loved the small one so much for making cookie and cupcake-topping menageries, so we’ve brought in a bigger one so you can go wild on larger cakes too. 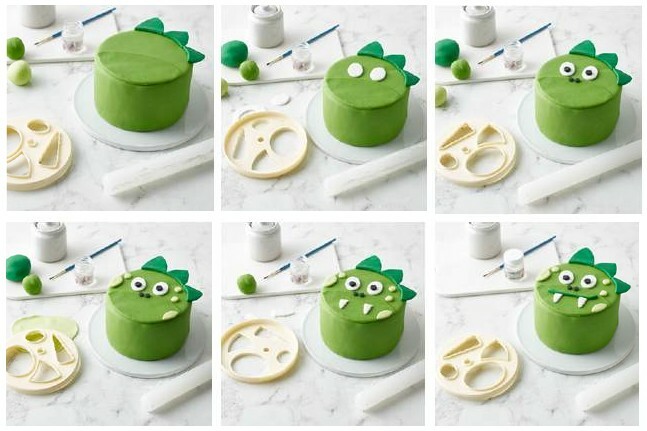 So whether you’re topping a cupcake with a tiny triceratops or celebration bakes with a sabre-toothed ‘saur, it’s so easy to achieve t-rexcellent results. Dust your work area, roll out dark green icing and cut out a circle for each head using the face side of the cutter. Cut out the snout using the face side and attach to the head with edible glue. Using lighter green icing, cut out the pieces for the frills using the ‘ear’ cutter – six for each head – and glue round the top edge of each head. For the eyes, use the smaller oval cutter and white icing. Make the pupils with black icing and the small round cutter. Use the ‘ear’ cutter to make the teeth, then shape the three horns out of white icing with your fingers and attach with glue. Cover a 6″ cake with green icing. Using the same green icing, cut out the snout using the main ‘face’ side of the cutter. Cut three frills out of darker green icing using the ‘ear’ cutter on the other side of the cutter. Attach the snout and the frills to the top of your cake using edible glue. Make the pupils with black icing and the small round cutter. Roll smaller balls of black icing for the nostrils. 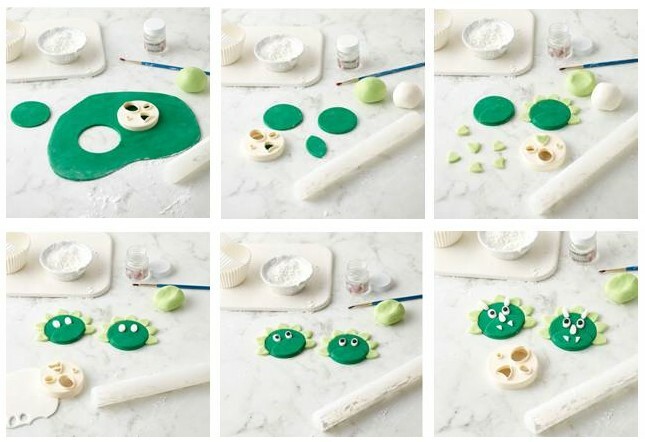 Using lighter green icing, cut spots using the smaller oval and small round cutters, and attach with edible glue. Roll out a little more white icing and use the ‘horn’ cutter to make the teeth. Finally, roll a small ‘snake’ of the darker green icing to make a mouth and attach above the teeth. In search of more dinosaur bakes? Check out our Dinosaur Swiss Roll Cake and Dinosaur Ruffle Cake step-by-steps.